With Halloween coming up and my plans to make a tango dress, I started looking around for garters. I could find none that I liked so I made my own instead. I measured around my leg where I wanted the garter to be and cut 1-inch wide black elastic 2-3 inches shorter than that. 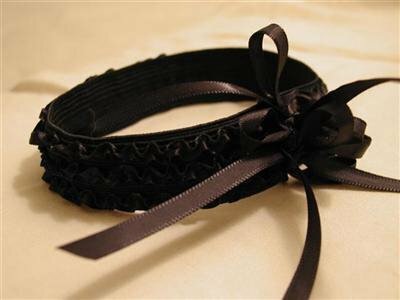 I then just sewed three strips of black ribbon onto the elastic and tied the ends in bows.